The exhibition presents a comprehensive overview of Meissen Porcelain art from the Baroque to the Biedermeier era. Meissener Porzellan (Meissen Porcelain) has never before been displayed in this context alongside works of art on loan from all around the world. The Staatliche Kunstsammlungen Dresden are taking the anniversary of the invention of European porcelain as an opportunity to exhibit Meissen Porcelain for the first time in the building which August the Strong dedicated to the presentation of the royal porcelain treasures from the Far East and from Meissen – the Japanisches Palais. In 1710 August the Strong established the first European porcelain manufactory in Meissen. Thereafter, Meissen Porcelain swiftly became an indispensable status symbol for the European aristocracy. Today, it continues to be the epitome of sophisticated table culture and luxurious room décor. In order to create an appropriate setting in which to indulge his ‘maladie de porcelaine’, the Elector planned to convert the Japanisches Palais into a Porcelain Palace. This project, however, was never completed. The exhibition Triumph of the Blue Swords encompasses a total of around 800 porcelain items, including a large number of the holdings of the Dresden collection that are not normally on public display. They are complemented by a wide range of items on loan from museums and collections around the world in places as diverse as California, Moscow, New York, London, Paris, Prague and Budapest. The development and manufacture of porcelain, which has previously only been demonstrated with reference to a small number of specimens, will be presented in detail, drawing upon the latest research findings. The exhibition focuses on the period up to 1815, during which Meissen developed the whole spectrum of possibilities that would thereafter be open to European porcelain. In these first hundred years, Meissen was the epitome of European porcelain art, long defying the competition from the newly founded manufactories and even managing to survive the crises of the Seven Years War and the Napoleonic Wars, right down to the present day. 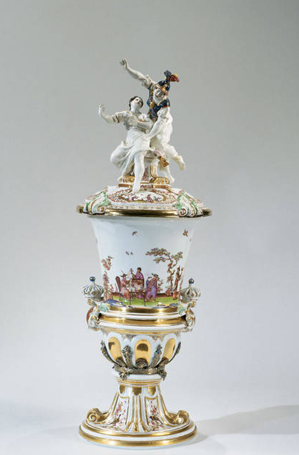 Until 1756 Meissen was the predominant manufactory in Europe; after that, the leading role was taken over by Sèvres, and Meissen had to reposition itself. Unlike previous presentations, this exhibition consciously integrates the concept of crisis and new beginnings. The exhibition pays particular attention to the table service. For one thing because, as the most important product of the Meissen Manufactory, it has had a profound influence on table culture in general. For another, because it especially underlines the importance of Meissen Porcelain for diplomatic gifts. Among the items on display are two table services commissioned by the Prussian King Friedrich II: a service designed on a Prussian/musical theme with a green scale-pattern rim, and the set known as the “Möllendorff” service, which was a gift for the Prussian General Möllendorff. Both services are opulently displayed on a dinner table. The Meissen Manufactory was the first to produce a table service made of porcelain. In Apollo Magazine, Louise Nicholson profiles two of the collectors who have offered loans for the exhibition, Kurt and Jutta Salfeld, whose porcelain birds are among the rarest of all Meissen production. We announce a conference to be held June 17-18, 2011 at the International Institute of Social History in Amsterdam (NL). The conference will explore the transnational dimensions of mutiny and maritime radicalism during the great cycle of war and revolution beginning in the mid-1750s, progressing through the eras of the American, French, and Haitian Revolutions, into the period of the South American Wars for Liberation, and concluding with the revolutionary movements of the 1830s-40s. Dror Wahrman is the Ruth N. Halls Professor of history and director of the Center for Eighteenth-Century Studies at Indiana University Bloomington. He is also professor of history at the Hebrew University in Jerusalem. He has written and edited numerous articles and books including The Making of the Modern Self (Yale University Press, 2004), which received the Ben Snow Prize from the North American Conference on British Studies and the Louis Gottschalk Prize from the American Society for Eighteenth-Century Studies. Wahrman’s main research topics centre on the advent of modernity in Europe, and on what the term ‘modernity’ might mean. His work has explored key narratives that the modern West tells about itself—the emergence of class society, the rise of the middle class, and the emergence of the modern individual or self. His current projects include a book-length exploration of the little known painter Edward Collier and a co-authored book (with Jonathan Sheehan of the University of California-Berkeley) about chance, order, and providence in the transition from the early modern period to the eighteenth and nineteenth centuries. Enquiries to Sue Carr, Executive Secretary, s.carr@ucl.ac.uk or tel. 020 7387 7532. A PDF file of the event flyer is available here. Summer is here, but I think we’re living in the late autumn of the print magazine. There’s been lots of talk in academic circles about the dubious future of paper-format journals, but it’s perhaps interesting to consider the migration to the digital realm from both sides of the periodical spectrum — not only from the the Ivory Tower of erudition but also from the populism of Main Street. The point has been brought home to me over the past year on a number of occasions as I’ve first learned of the end of various design magazines from design blogs. An article in Sunday’s edition of The New York Times (20 June 2010) presents the next logical step. Claire Cain Miller explains the origins of a new online design magazine, Lonny: “Michelle Adams, 27, a former market assistant at Domino, and Patrick Cline, 34, a photographer and photo retoucher, were talking . . . in May 2009 after Condé Nast closed Domino, its sprightly home magazine. Over dinner at Chili’s, they mourned the loss of the magazine and other design magazines, like Blueprint and House & Garden, and joked that they should start their own.” So they did, and 600,000 readers later, theirs looks to me like the future. A blog, of course, isn’t exactly the same thing as a digital magazine, but this relatively new format seems to be coming of age in its own right, and there are certainly loads of fine examples that facilitate an exchange of information that simply couldn’t have happened in any way even ten years ago. To underscore just two: I’m still a big fan of Courtney Barnes’s Style Court, and I’ve recently discovered a new favorite from Janet Blyberg, JCB. Janet was on the Attingham Program with me earlier this month (she supplies a terrific episodic account of the trip with amazing photographs). As an art historian and museum professional, she brings a smart sensibility to a wide range of topics — including lots of gems for dix-huitièmistes: postings, for instance, on Woodford Mansion in Philadelphia’s Fairmount Park and the house built by the botanist John Bartram (also in Philadelphia). The food postings are pretty terrific, too. In the midst of this media migration from paper to the digital realm (reinforced by the likes of Scribd), things will surely be lost . . . and lots gained. It seems to me that one challenge for scholarly publications is finding a way not simply to mimic the older paper versions but to take advantage of the potential for entirely new features that just weren’t possible previously. The likes of Style Court and JCB might just be doing crucial, experimental work with important implications for even stuffy, scholarly publications. They definitely make the world a brighter place. changes in taste in the early 18th century. The main section of the exhibition will be dedicated to the art of the bozzetto and the modelletto (an initial small version of a proposed large work for presentation to patrons), in which Sebastiano Ricci was not only a supreme master, but also an ingenious innovator. Sebastiano’s letter to Giacomo Tassi of 14 November 1731 is usually considered to mark the starting point for a reversal of values that saw the aesthetic preeminence of the work of art pass from its “finished” version, conceived for public display, to the bozzetto, the preliminary work usually destined to remain in the studio. Sebastiano’s last sentence in the letter addressed to his patron – “moreover, this small work is the original and the altarpiece is the copy” – ushered in a view that was eventually so successful that it even influenced most 20th-century critics. The exhibition will also provide the opportunity for comparisons with the bozzetti of other major artists in the Venetian school. These artists include Antonio Pellegrini, the young Giambattista Tiepolo, Gaspare Diziani, Giambattista Pittoni and Jacopo Amigoni. There will also be a special focus on Ricci’s graphic works, now mainly kept in the Drawing and Prints Cabinet of the Accademia, Venice, and in the royal collections of Windsor Castle. Ricci’s swirling exploratory graphic technique lends itself to precise comparisons with his own modelletti and with the work of the sculptor Giovanni Maria Morlaiter. In fact, the exhibition will also include some terracotta models and bozzetti from the workshop “remainders” of Giovanni Maria Morlaiter – Sebastiano Ricci’s alter ego in sculpture – now in storage in the Ca’ Rezzonico Museum of Eighteenth-Century Venetian Art, Venice. We welcome proposals from researchers working in a broad range of areas, including painting, sculpture, architecture, material culture, design, film, literature, cultural geography and print cultures. Please send proposals of 250 words (for 15-minute papers) to writingirisharthistory@gmail.com or to Caroline McGee and Niamh NicGhabhann, TRIARC – Trinity Irish Art Research Centre, Department of History of Art and Architecture, Provost’s House Stables, Trinity College Dublin, Dublin 2. This year the Musée des Beaux-Arts, Strasbourg will present an exhibition focused around the painter Jean Barbault (Val-d’Oise, 1718 — Rome, 1762). This seemed an opportune moment to spotlight such an enticing artist since the museum acquired one of his masterpieces just a few short months ago. The exhibition thus unveils a complete, eloquent panorama of his work. Barbault is renowned for whimsical figures painted with virtuosity and refined color as well as canvases treating “Mascarades” organized by residents at the Academy of France in Rome. He also signed landscapes of ruins and considered himself a “painter of History.” As an added feature the exhibition is showing a series representing his French contemporaries working in Rome at the same period, including Fragonard, who, like him were deeply attracted to Ancient (fascinating) and modern (picturesque) Rome and dazzled by Italian light. Last year the Musée des Beaux-Arts further enriched its collection (thanks to a purchase made possible by the City of Strasbourg and by the Fonds Régional d’Acquisition des Musées / Regional Fund for Museum Acquisitions) with a major painting entitled Neapolitan Shepard and Buffalo Cow Leaving the Grotto by Jean Barbault. This is one of the mid-18th century’s most attractive works of French (and Italian) painting. Its subject matter and spiritual treatment personify the very essence of the Age of Enlightenment. The painting is a masterpiece done in Italy circa 1750 by an artist who largely remains in the shadows despite exhibitions previously shown at the Museums of Beauvais, Angers and Valence, 1974-1975. The exhibit – and its catalog – gives an overview of his painted work. Barbault settled in Rome in 1747, remaining in this fascinating city and fully integrating himself into Italian life until his death. He was an original artist, the author of characters in typical Italian costume and exotic figures for Mascarade, who also undertook the register of ruins. Despite a rather dramatic existence, he considered himself an artist-in-full. Besides an extraordinary collection of engravings by the Italian Piranesi, the exhibition also exposes the unique milieu of residents at the Academy of France in Rome. Barbault was the contemporary of Jean-Honoré Fragonard and belonged to an exciting generation, between Boucher and David, Rocaille and Neo-Classicism. Catalogue: Pierre Rosenberg et al., Jean Barbault: Le théâtre de la vie italienne (Strasbourg: Editions des Musées de la Ville de Strasbourg, 2010), 160 pages (ISBN: 9782351250815), $53.50, available at artbooks.com. Pre-order yours through the Johns Hopkins University Press (800.748.1784). Material culture in its broadest dimension, including the high arts of painting and sculpture, the decorative arts (furniture, ceramics, metalwork, etc. ), and everyday objects of all kinds. Collecting practices, be they institutionalized activities associated with museums, governmental authorities, and religious entities, or collecting done by individuals and social groups. The role of objects in defining self, community, and difference in an increasingly international and globalized world, with cross-cultural exchange and travel the central modes of object transfer. Objects as constitutive of historical narratives, be they devised by historical figures seeking to understand their past or in the form of modern scholarly narratives. The series publishes interdisciplinary and comparative research on objects that addresses one or more of these perspectives and includes monographs, thematic studies, and edited volumes of essays. a formal prospectus including: abstract, brief statement of your critical methodology, table of contents, sample chapter, estimated word count, estimate of the number and type of illustrations to be included, and a c.v.